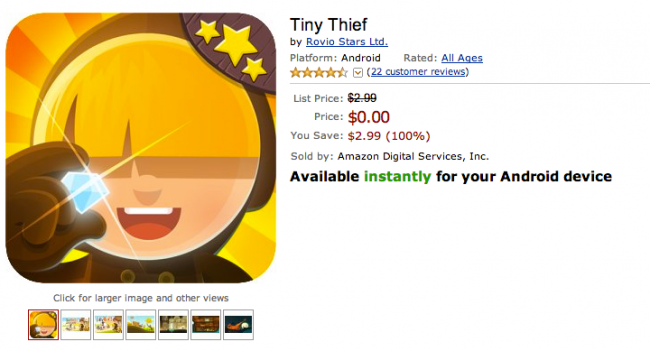 If you act quickly, well you do have 24 hours technically, then you can grab Rovio’s Tiny Thief for free off of Amazon’s Appstore for Android. The game is listed on Google Play and other stores for $3 usually, so this is a total steal. The deal is so good that I actually downloaded the Amazon Appstore just for this, so that should tell you something. In Tiny Thief, you play a cute little character, who must go through tons of different levels to collect booty. The levels are very playful, and some are quite tricky. In essence, each level is its own puzzle which you must solve, complete with baddies in each one. It’s a great game, and we think it is Rovio’s best work in some time. Go grab it if you haven’t already.